Food without wine can be somewhat fine…if enforced. It’s now February, in case you were wondering. For some people this is just another month, albeit a shorter version. For others, like myself, it represents the moment when we can finally awake from our Dry January slumber and enjoy one of the best parts about cooking and eating: matching/pairing a wine to said meal! I imagine the feeling I had today is like a bear coming out of hibernation and having that first taste of a fish supper. (For the record, I don’t drink fish supper.) But speaking of fish supper that is what we ate this evening when Liz came home from a day’s teaching. If you fancy trying a no-fuss, comfort-food option then look no further than Jamie Oliver’s Fish Pie. It’s quick, super easy and unlike his 30-minute meals – that ACTUALLY take an hour and a half by the time you’ve done the prep – this is fast and relatively effortless by comparison. I must admit, I love eating and I enjoy the luxurious and perhaps once-in-a-lifetime type of affair as much as the beautifully unpretentious, depending on what mood I’m in. I also love cooking because, for me, it’s a reminder that I can do ‘normal’ things and lead a ‘normal’ life. I guess that begs the question: what is normal? Perhaps I’m trying to say that I crave doing things that I perceive the majority of my friends doing in their version of a ‘normal’ life. Add to the mix cleaning, gardening (it must be said that my wonderful in-laws do *quite* a bit of this when I’m away and they can come down south! 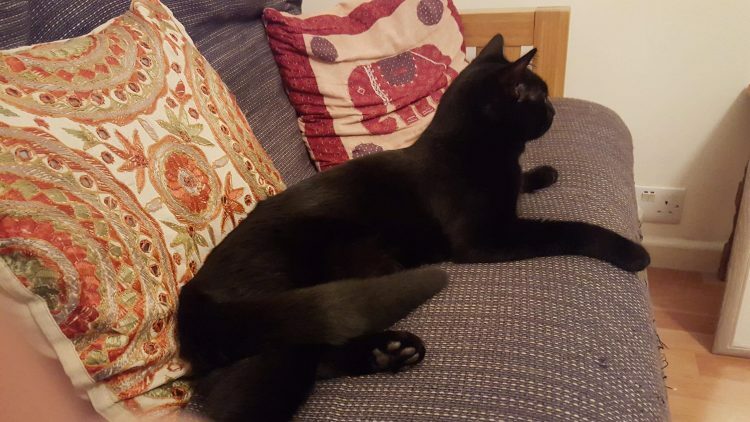 ), ironing (Father-in-law), washing up, socialising, putting up shelves (again, assisted by the in-laws), painting walls (+ in-laws), and even cat-sitting (may I introduce Joey, the beautiful black cat who’s a real dude!) and you have one content 1st Baritone in The King’s Singers! So, January’s gone and I have a sneaky suspicion that the rest of this year is going to fly by, too! Hope you’re well wherever you’re reading this and I look forward to seeing as many of you as soon as possible.